A Liberal's Libretto: The Dallas Opera's new home ... for those with "bigger bottoms". The Dallas Opera's new home ... for those with "bigger bottoms". When Denyce Graves and Thomas Hampson walk on stage at the Winspear Opera House in Dallas tonight, they will be celebrating the undertaking of the British-based architecture firm Foster+Partners to design an opera theatre for the 21st century. A capacity audience of 2,300 is expected in the oval house, which was built for The Dallas Opera. The first opera house by his firm, Lord Foster and his architects, led by Spencer de Grey, hoped to break down barriers and entice a younger and more diverse crowd. The team from Foster+Partners went on a tour of a number of opera houses before they began. They concluding that the horseshoe shape found in the opera houses of London, Munich and St Petersburg offered the most intimate experience because it brought the stage closer to the auditorium. What's more? Not only are they planning to attract a younger and more diverse crowd but also a somewhat "larger" crowd - and, were nice enough to accommodate for that. They reduced the number of seats from 3,300 in Dallas's old opera house to 2,200 – slightly more than Covent Garden but substantially fewer than New York's Metropolitan Opera – mainly to enhance the dramatic experience, but also partly in recognition that in this age, seats have to be larger. "People want wider seats, as basically they have bigger bottoms," de Grey said. Is it me, or does that seem like a cheeky british way of saying that Americans have fat keisters? 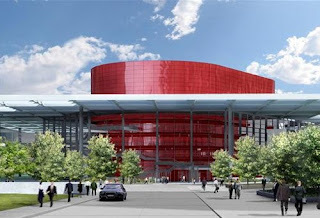 Links: Guardian.co.uk - Foster+Partners - The Dallas Opera. "Is it me, or does that seem like a cheeky british way of saying that Americans have fat keisters?" As someone who has attended the opera in the old theatre, I'd say it's more likely a cheeky British way of saying that the seats were too darned close together. I'm 5'4" and had to sit at an angle to keep from banging my knees on the seat in front of me.